Price Range: $72 to $76. It is a full-bodied and well balanced cigar. It features subtle hints of anise, black cherry oak, blackberry, and dark chocolate. Available by the Box, Sampler or Single, grab a box today and become instantly hooked. New & Noteworthy: Slow Smoking Written on July 18, 2012 by Richard Carleton Hacker. In this fast-paced world, cigars are an anomaly, as their tobaccos are aged naturally and consequently, cannot be rushed, their hand-rolled construction is methodical, and even the act of smoking them is typically a leisure-time activity. 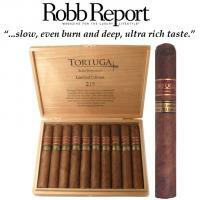 All of this is personified in the Tortuga 215 Edición Limitada 2011 ($8 to $10, depending on size). 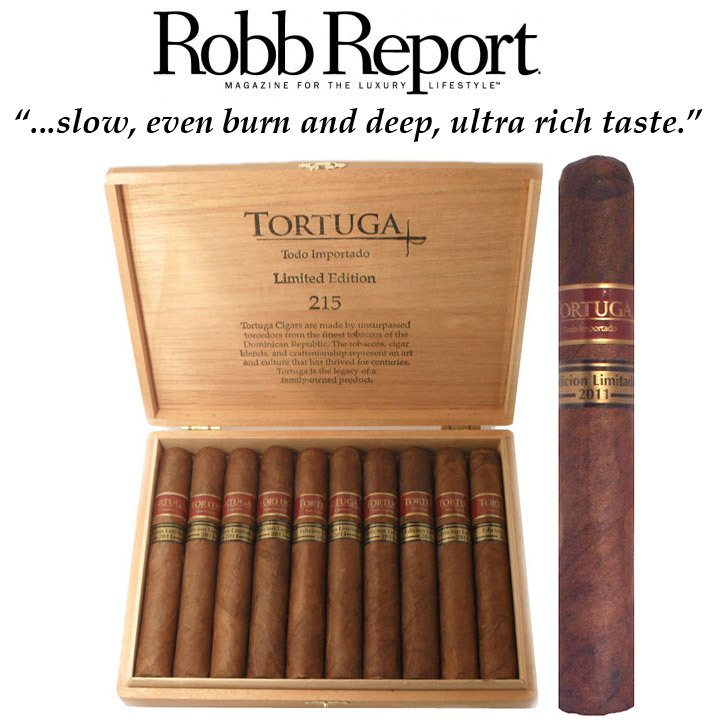 Tortuga means "turtle" in Spanish, and the name of this boutique cigar was inspired by the fact that its tobaccos have been aged for five years, thus contributing to the T215's slow, even burn and deep, ultra rich taste. Hand-rolled in the Dominican Republic, the limited-production Tortuga 215 features a Nicaraguan Corojo wrapper with the hue of tanned leather, a Honduran and Dominican filler, and a Nicaraguan binder, all of which combine to produce a medium spicy aroma and a full, mellow flavor reminiscent of veal, curry, and a hint of cream sherry. Four sizes, each packed 10 to a box, are offered: robusto (5x52), torpedo (6x54), toro (6x54), and titan (6x60). With only 83 authorized dealers in the United States, the Tortuga 215 is not easy to find, but for those who want to speed up their acquisition of a box, it can be ordered from dealers listed on its website, pending availability.